CA. Candidate should have minimum five years working experience in the same field. CA/CFA (Financial Analyst) Candidate should have minimum 05 years of working experience in the same field. 1. A First Class Bachelor/Masters Degree in any discipline from Government recognized Institution and 2. MBA in HRMD from Government recognized Institution and 3. Proficiency in Computer is essential. A First Class Bachelor/Masters Degree in any discipline from Government recognized Institution and 2. MBA in Marketing from Government recognized Institution and 3. Proficiency in Computer is essential. A First Class Bachelors or Second class Master Degree in Civil Engineering from Government recognized Institution. A Post Graduate Degree (Second Class) ii. Ex-Army/Air force/ Navy/Para Military / Police/SAF/CRP/RPF Person who should have retired as a JCO/NCO or equivalent post. Apex Bank Recruitment 2019 has been announced for the below vacancies. Read the following Job Notification details to get a clear idea about Registration process, Eligibility, Qualification, How to apply, No of Vacancies, Salary, Job Location, Links to apply, Selection procedure, age limit and all the instructions before applying for this job. Click the FACEBOOK ICON below To get Alerts of All Job Notifications from WAY2TNPSC Interested and Eligible Candidates can apply before 15-May-18. Keep on reading this page to know all the above details. So, it will be helpful to know the procedure and details for the candidates who wish to apply for this particular vacancies. 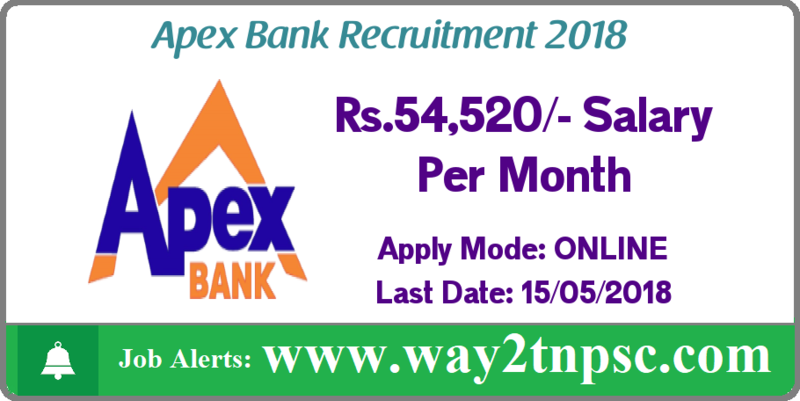 The above Notification ( Apex bank Job Recruitment 2018 | Apply online ) briefly describes about the details of latest announcement or notification includes important dates like release date , last date of application submission, details regarding fees, exam timings. Candidates, check all the needs and apply accordingly.